WordPress is a great blogging platform. People who love blogging would want a great looking website both for web users and mobile users. As more and more people are using mobile phones to access web , it becomes very important to have a great mobile WordPress themes. Having a mobile optimized website theme makes a user friendly article reading on mobile devices. These wordpress themes perfectly display your articles on mobiles, tablets apart from great desktop and laptop viewing. The result is a happy visitor experience. 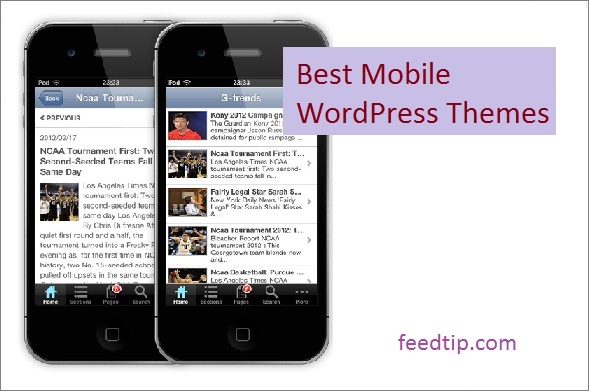 For your convenience we have shortlisted a list of best mobile wordpress themes. Breezy is a neat, clean mobile wordpress theme. You can use this theme as a major wordpress theme or secondary mobiles only theme. Navigation menu and loading screen are fully customizable. Other things that can easily be changed are font size, color, line height, title and alignment. The theme is lightweight. It has a responsive liquid layout theme. Besides this theme looking good on mobiles/ tablets it looks impressive on desktops and laptops as well. It includes free addons worth $29- Morph plugin and Page Loader plugin. Galleries are touch enabled. Compatible across all major browsers on mobiles, tablets and desktops. Plenty of shortcodes that are customizable. It is a translation ready theme. The theme costs $ 34. Grunt is a fresh , clean mobile wordpress theme. It can be used as primary theme or only as a secondary mobile theme. Grunt is a multipurpose theme. You can use this theme for blogging website, web app only, portfolio website, galleries etc. Retina ready enables high resolution displays. It has a accordion menu with 2 levels. Includes social sharing so there is no need to separately install Facebook, Twitter and Google plus. There are 9 header color options which you can individually use for an post or page. The header menus can be removed. Galleries are enabled with touch. Translation ready theme makes your website multilingual. Page footer is widgetized. It has a liquid design layout. Compatible across all major browsers from all type of devices. Huge number of customizable shortcodes to add buttons, boxes, images, etc. 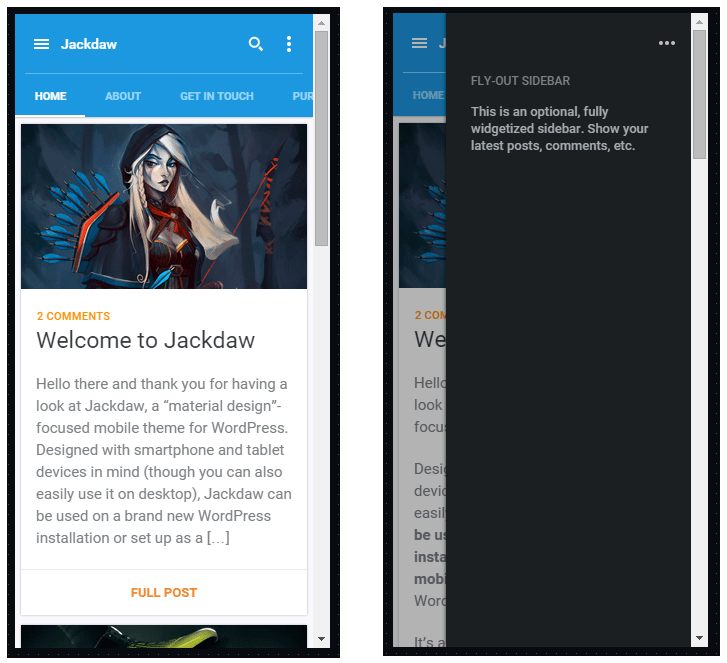 Jackdaw is a mobile wordpress theme. It can be used as primary(both on mobiles & desktop) or secondary theme ( only to be used mobile devices).You can customize theme- header and menus , page transitions , text colors, titles, font sizes and other design element. It is a clean lightweight theme. Gallery is touch enabled. Compatible across all major browsers of various screen devices. Contains plenty of powerful customizable shortcodes. Jackdaw will ensure that it’s beautiful animations make your website a unique one. Rogue is a versatile mobile wordpress website. You can install rogue as primary theme or only as mobile theme. The theme is a responive liquid design. It has free addons worth $19- TapTap plugin and Page Loader plugin. TapTap plugin adds a customizable header and navigations menu. Inserting custom page transitions by using page loader plugin. Other things you customize are title, body text font, size, colors, spacing etc. Galleries are touch enabled. It includes editable child theme. Rogue is compatible across major browsers. With powerful shortcodes you can add buttons, tabs, images etc wherever you like in the page. The theme is easy to install and use. Below is the screenshot of two demo options. 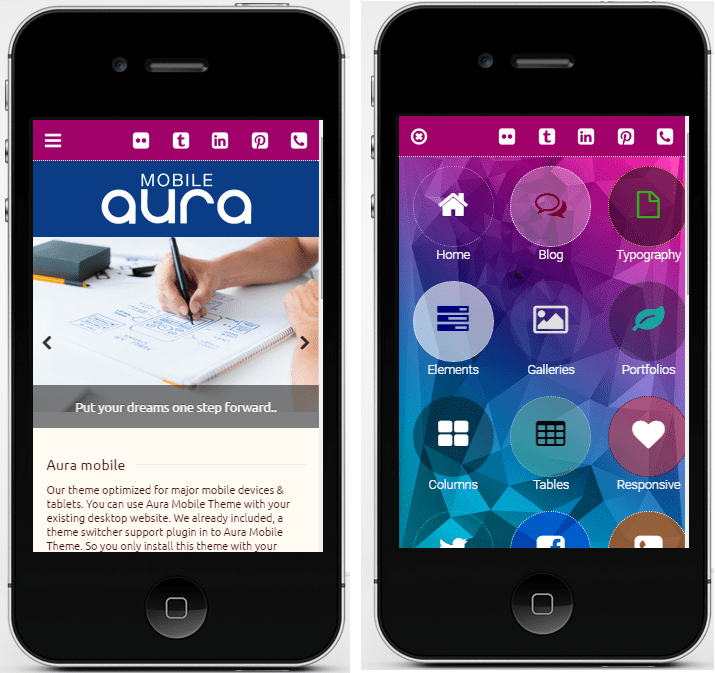 Aura is a mobile wordpress theme. The design is clean and modern. Latest coding techniques HTML5 and CSS3 have been used in making this theme. Retina ready theme. It is a translation ready theme ensuring your website is multilingual. Aura is extremely customizable theme. You can customize menus, buttons,image backgrounds, image icons and lot’s more. You can use this theme as mobiles only or as primary theme. It has 3 layout options, unlimited color options, variations, 370 image icons, flex slider, photo swipe, 19 shortcodes, WMF shortcodes and much more. Supports all post types. You can make a perfect blog or portfolio or gallery pages. Videos, images, text are responsive. It is compatible across all major browsers. Perfect look you want in a mobile viewing. 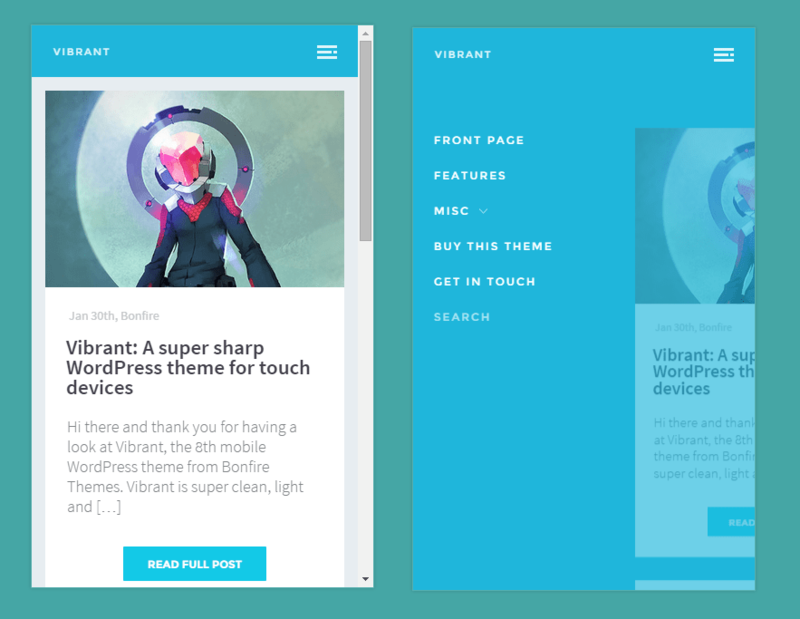 Vibrant is a mobile wordpress theme. The design is a clean and minimalist looking . It has a 2 level accordion menu. CSS3 and jQuery animation effects have been used. The theme can be used as primary or mobile only theme. Vibrant is multipurpose theme that can be used for blogging, business, portfolio etc. Retina ready. Compatible across all major browsers from various screen devices. It has a responsive liquid layout. Vibrant is a translation and localization ready theme.There are 9 color options for page and posts. It includes page loader plugin, editable child theme, widgetized page footer and much more. Monolith is It has 2 level slide in menus. The theme presents your website content with strong visuals. 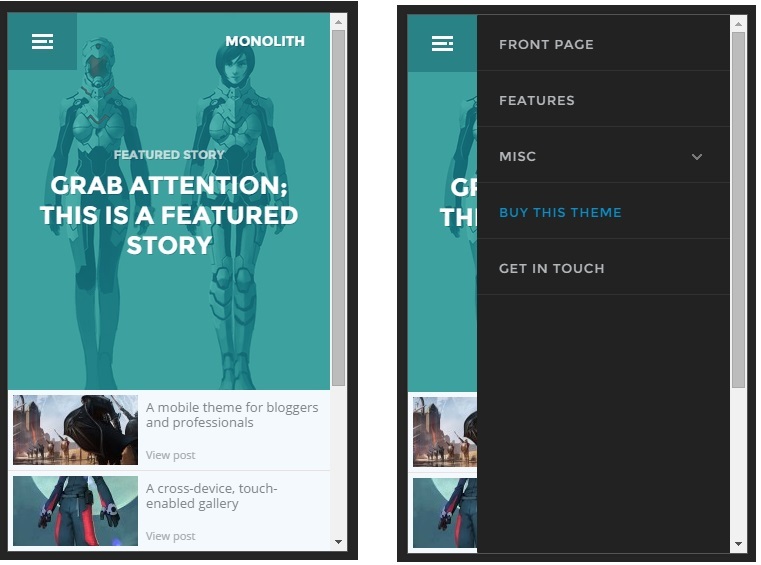 Monolith is a multipurpose theme. It can be used for blogging, show your portfolio, as a corporate theme or anything else to promote your business. You can use this theme as primary theme or mobile only theme. You can have intro image on the posts, option to have featured article on front page. Monolith allows swiping of photos by swiping, using mouse keys and navigation arrows. Retina ready. Compatible across wide range of browsers from all screen devices. There are 9 header color options, plenty of high quality customizable shortcodes, includes editable child theme and much more. 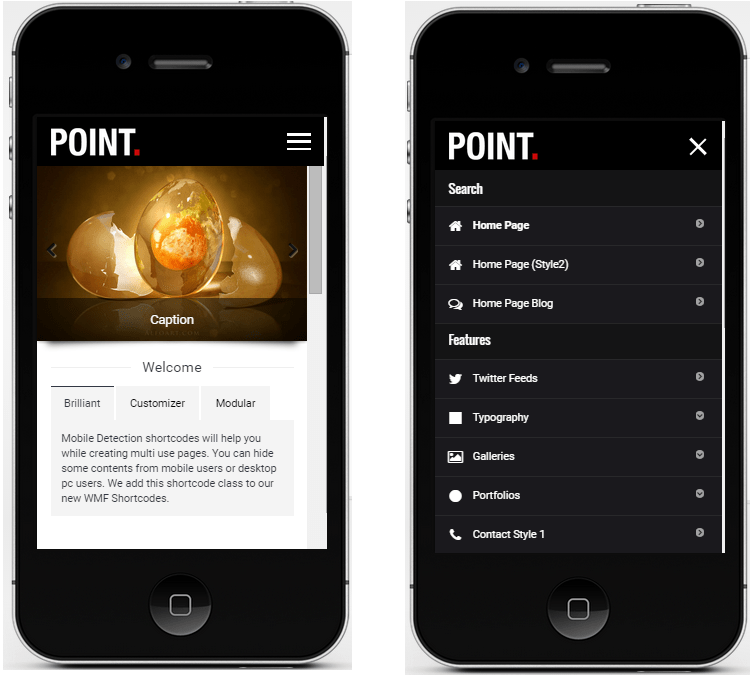 Point is a mobile wordpress theme. Latest coding techniques using HTML5 and CSS3 have been used. Retina ready. It will make your website multilingual as this theme is translation ready. The admin options panels provides 50+ customizing options. Point can be used for any type of website besides blogging. The design is clean and modern. Supports all post types. Point has 6 theme options, accordion menu with 2 levels, over 300 fontawesome icons, WMF shortcodes, 19 shortcodes,unlimited color options and lots more. 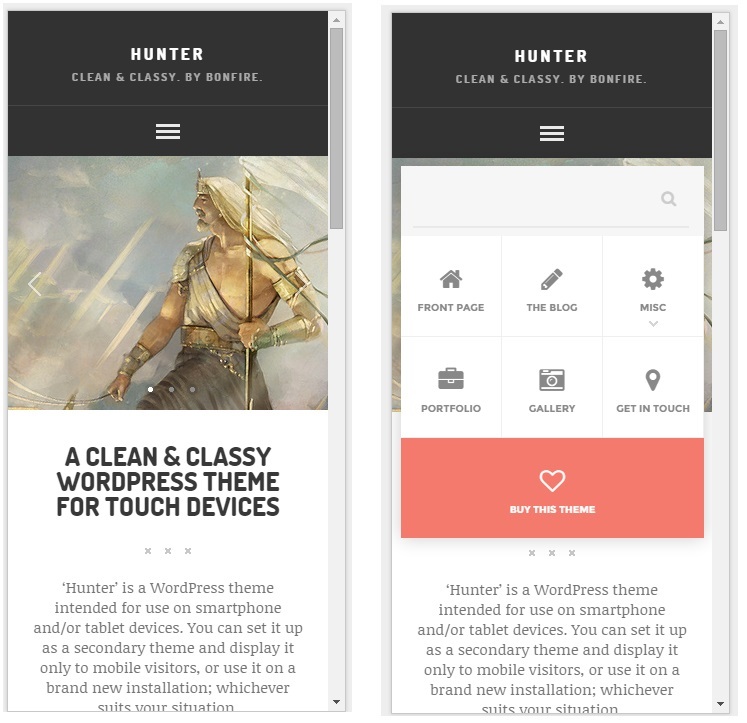 Hunter is a flat clean mobile wordpress theme. Use it as a primary theme or mobiles only theme. It is a multipurpose theme as you can use it for blogging, make portfolios, galleries, advertise services etc. The design is responsive liquid layout. Compatible across browsers of various devices. Retina ready. The gallery is touch enabled. Background images and colors can be changed. It has a 2 level accordion menu, over 350 fontawesome icons, animated comment form, includes editable child theme and much more to make a beautiful website. 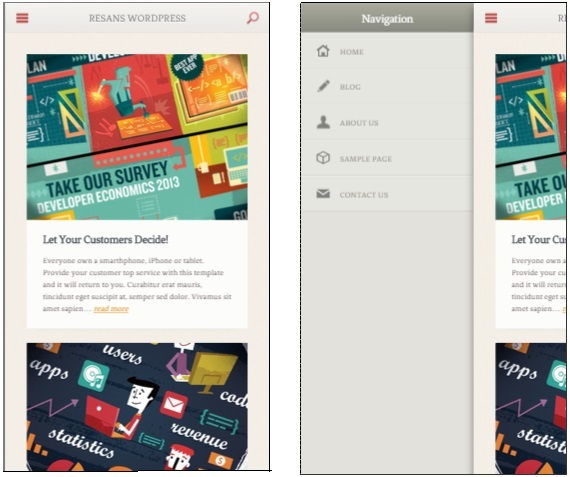 Resans is responsive mobile wordpress theme. The design of your blogs is masonry.It has free addons worth $50. You either keep Resans as main theme or mobile only theme. Retina ready. There is infinite scrolling. Loading of pages have animations. It supports swipe gestures. There are 5 after load page animations, thirteen background pattern, 740 + icons, 6 fonts etc. Unlimited font colors, header background colors ,social media color icons, content color backgrounds, footer background colors and menu background colors. You can hide or show comments, meta data on every post or page. Resan is best suited for those who have a blogging website. Simple, neat and clean presentation of your articles in mobile devices. I probably would love to use it as my secondary mobiles only theme. Lotus is a clean , beautiful modern looking mobile theme. It is a responsive liquid layout theme. Images are touch baed. Retina ready ensures high resolution displays. The theme has 2 variations – dark and light. It is has over 470 retina ready icons, over 14 PSD files and CSS3 animations. 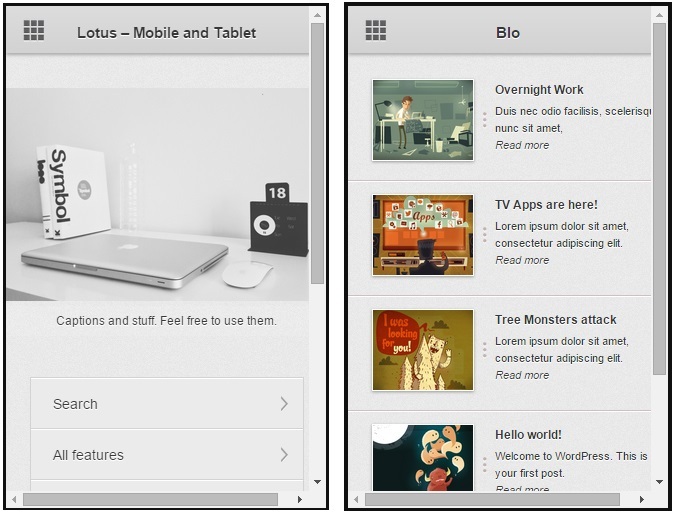 Lotus is build using HTML5, CSS3 and PHP coding. Great mobile theme that will impress your site visitors. 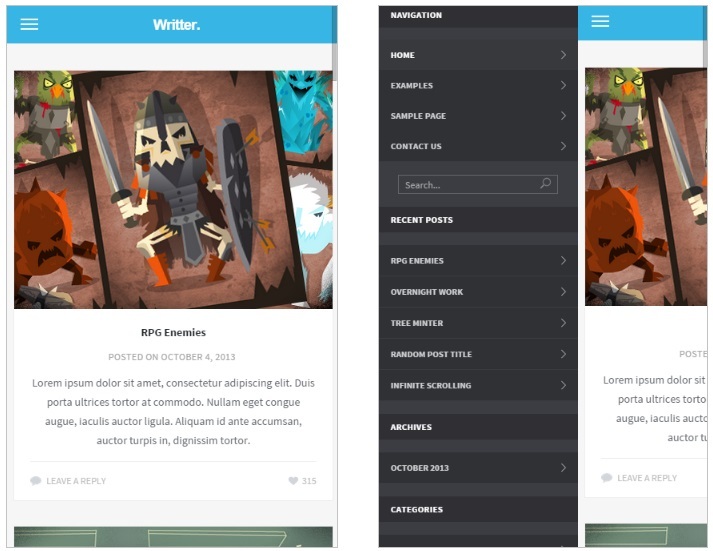 Writter is a grid design mobile wordpress theme. The grid is masonry with CSS3 animations. It has a responsive liquid layout. The theme is clean, modern with a touch of colors. One of the best theme you can use for blogging. You can also use this theme for portfolio presentation. It supports 8 post formats, infinite scrolling, featured sticky posts , sidebar widgets and much more. Writter impressive typography will make a pleasant reading experience for the site visitors. Delta is minimalist flat mobile WordPress theme. Retina ready. The theme is responsive liquid layout. SEO optimized theme. HTML5 and CSS3 coding techniques have been used to built this theme. Compatible across all major browsers. Delta uses minimum number of jQuery plugins which enables this theme to run efficiently on older mobile devices as well a new mobile devices. 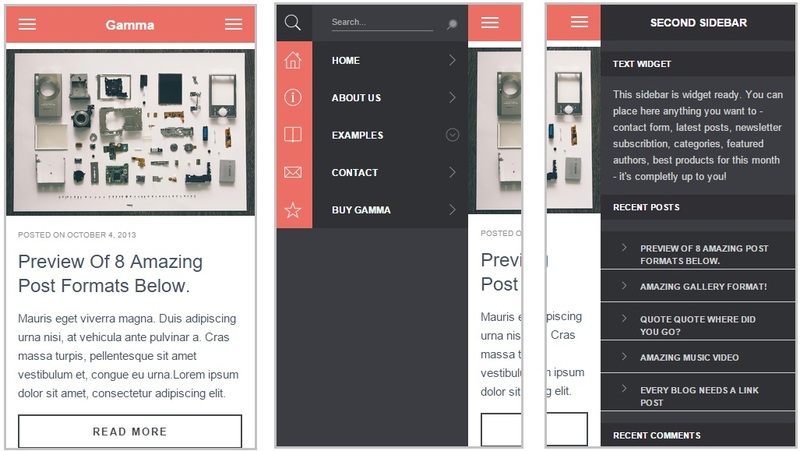 Gamma is clean clear mobile wordpress theme. The design modern and flat with awesome typography. It is a liquid layout responsive theme. Gamma has unlimited color options which can changed by using Gamma options panel. There are 2 navigation options in header one in right other in left. One can be used for main navigation menus and other can be used as sidebar widget area. It supports 8 post types. Compatible across major browsers. There is flexslider plugin to support galleries with swipe gestures. One of the cleanest theme for your website. 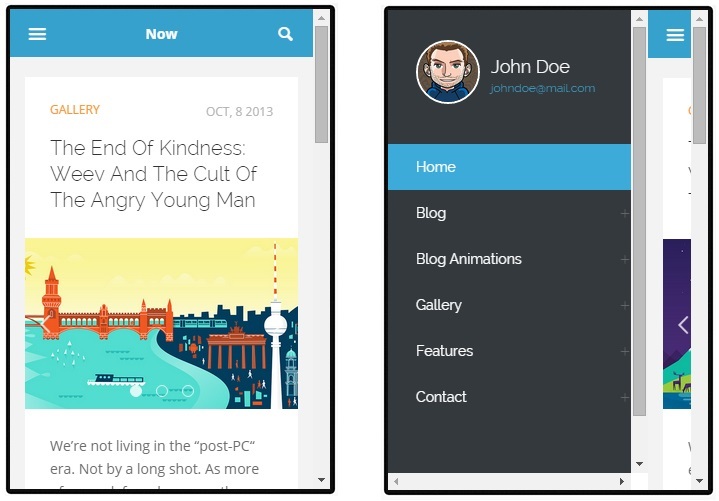 Now is a mobile wordpress theme. The theme is ideal for blogging. Easy to use this theme as mobile only as it this theme uses device switcher plugin. Design is clean, fast speed and modern. It is a responsive liquid layout. There are 400 color combinations and pick unlimited colors with color picker to customize theme. It supports 7 post types. Now has 16 shortcodes that are customizable. There are lot of page and gallery templates. 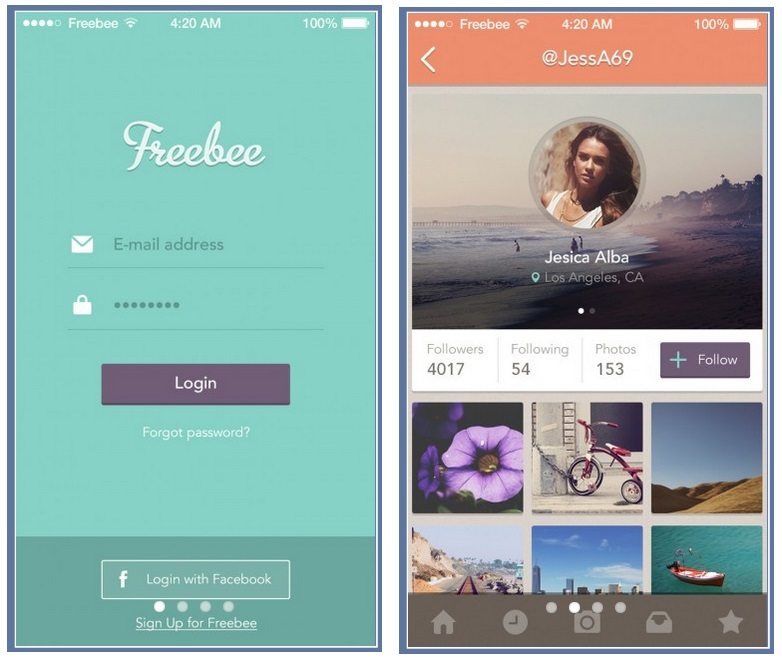 Mobilee is a mobile app to showcase your wordpress theme. It has both versions for android and apple users. Which can be downloaded from app store and Google Play. It has unlimited color options and 2 slider options.Retina Ready. Translation ready makes your website multilingual. Mobilee is a lightweight responsive app. 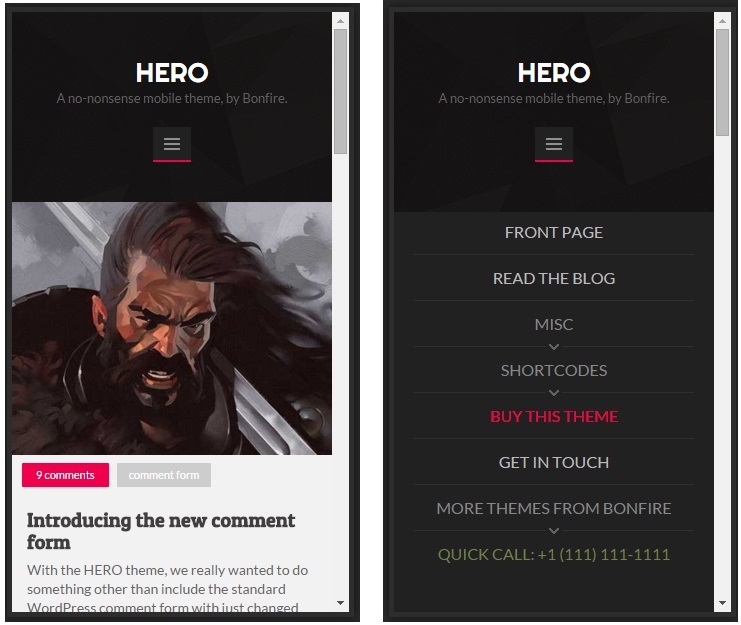 HERO is a clean mobile wordpress theme.The design is responsive liquid layout. You can use this theme as a mobile only theme. Translation ready theme. The photo galleries are touch and swipe enabled. 9 post types are supported. It contains plenty of shortcodes. Background color and images can be changed. Editable child theme is included. Spartan is an impressive mobile wordpress theme. The theme can be used for personal blogging, portfolios, corporate, business, organization of any type. It is a responsive liquid theme. The navigation system can be customized with your selection of colors. There are plenty of customizable shortcodes . Translation ready theme. 10 post types are supported. Background images and colors can easily be changed. Spartan looks elegant in landscape as well portrait. Image galleries support touch and swipe. This premium theme costs $29. 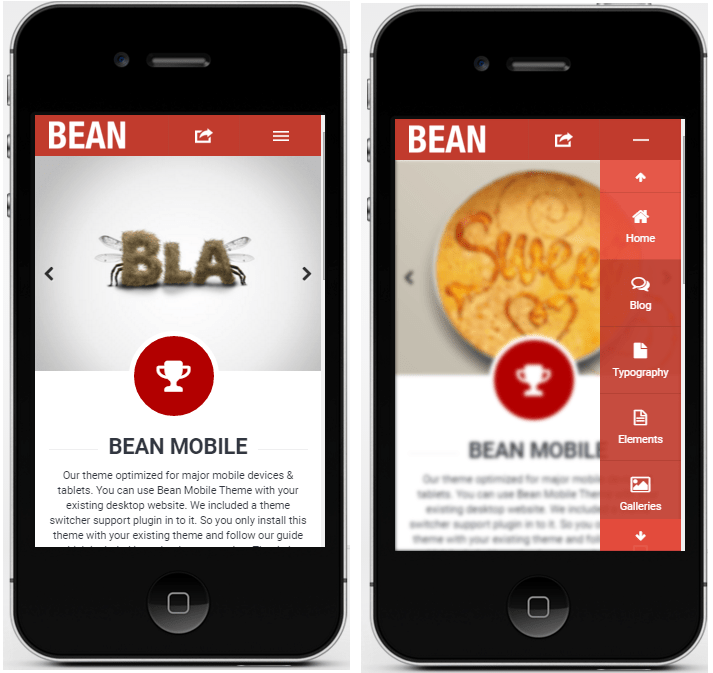 Bean is a mobile wordpress theme. Use this theme as a mobiles only theme as it supports all theme switchers. You can also use it as desktop theme as well. The navigation menu can placed at left or right header position. It opens like a slide. The theme is perfect for all kind of blogs. It supports all formats of posts. Image / photo galleries support touch swipe gestures. You can have custom porfolios,. This awesome theme is built using latest HTML5 and CSS3 coding. Compatible across all major browsers. There are 7 theme layout options, 60+ theme options, flex slider, +300 fontawesome icons, 19 shortcodes and lot more. 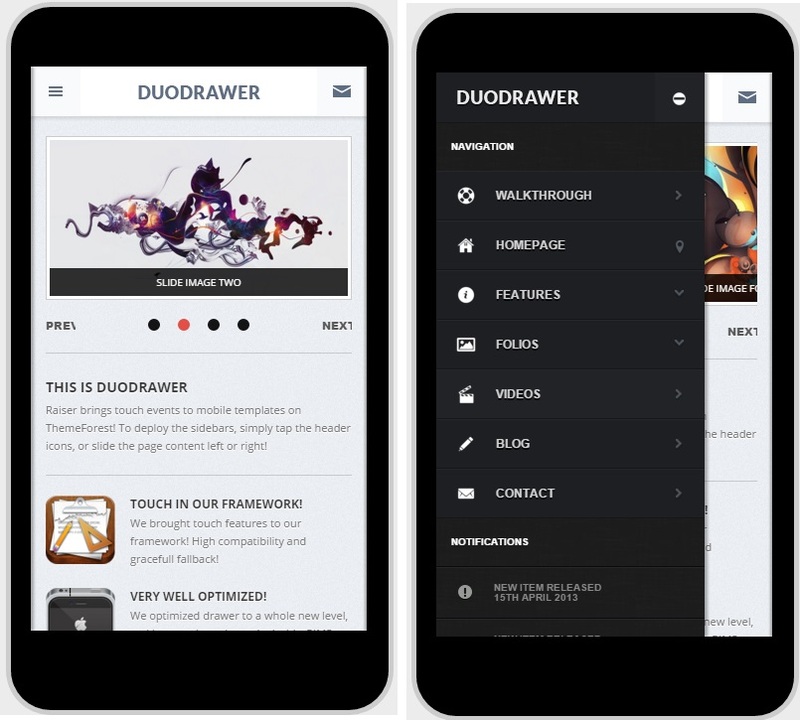 DuoDrawer is a mobile wordpress website. You can customize the theme with theme options panel. There are 25 setting options. Favicons, splash and logos can be uploaded from these settings. Image galleries support touch swipe. The theme has six custom templates for pages, 22 shortcodes, 800 icons, page preloader and lot’s more. Metro Mobile is a mobile wordpress theme. It is build using latest HTML5 and CSS3 coding techniques. The theme has a tiled design similar to windows 8 operating system. Translation ready theme. Compatible across all major browsers. There are 13 metro style tiles, 24 metro color options, 200 icons, unlimited menus and tiles, camera slider and lot’s more. Brave is a responsive mobile wordpress theme. The design is minimal and beautiful. This theme can be installed as a mobiles only theme. It supports touch enabled swipe photo gallery. The images can be swiped/pinched/zoomed. Retina ready theme. Brave has six color schemes, supports 10 post formats, plenty of customizable powerful shortcodes, includes editable child theme and much more. Touch is a multi-functional mobile wordpress theme. You can use it for blogging, portfolios, corporate page, or touch based galleries. The design is clean, unique with a liquid responsive layout. Compatible across browsers of various display devices. Touch is a translation ready them which will make your website multilingual. It has a two level accordion menu, retina ready, plenty of powerful shortcodes, includes editable child theme, multiple page templates and much more. You can also install as web app. The theme has beautiful animations powered by CSS3 and jQuery. Ultimate is mobile wordpress theme. It has a liquid layout which adjusts your website on all mobile devices. There are 6 theme color options, 5 post formats, 7 shortcodes, 3 gallery types, plenty of CSS3 3D animation effects and much more. The theme is clean with a retina display. With Ultimate you get another free mobile theme Slate. The package costs $29 which is cheap considering 2 theme options.